0. Why haven't we build SSP already?? Answer 0. Space transportation costs using old rockets have been too high, since we throw the rocket away after each flight! That’s no way to run an airline! Reusable rockets are the key. Most importantly, costs go down when volume goes up. That is why your TV doesn’t cost a million bucks. We need a much higher volume to orbit to make the lower cost reusable space vehicles pay for themselves. Only SSP, however, provides the huge market volume needed to finance the low-cost space transportation vehicles necessary. This chicken and egg situation is characteristic of several other SSP materiale requirements. See next question, for further details, but that is why a strongly financed company is necessary to successfuly build SSP. 1. How much would SSP cost? Only a much larger launch market can lower these costs. SSP is the only such huge market we know of with the volume required to enable the low-cost space transportation system necessary for a successful SSP business case. Sort of a chicken and egg situation, got to have one to get the other. 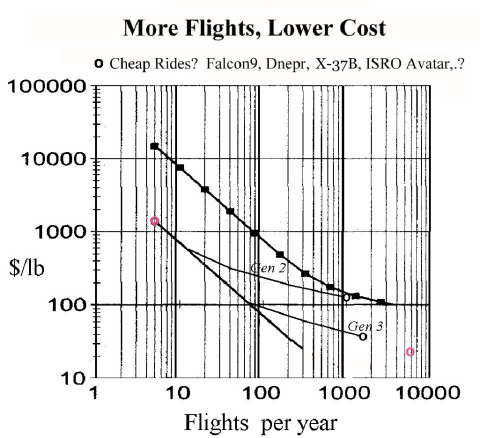 Low cost transportation to orbit to GSO is critical; launch costs to GSO must be reduced from thousands of dollars per pound to about $150/lb. The current leader in low cost to orbit is SpaceX. They currently quote about $50 million to put 3000 kg into Geo Transfer Orbit or about $10,000 per pound to GSO. SpaceX plans to add the necessary thermal protection to allow for first stage recovery on Falcon 9's fifth flight, probably in 2012. At $35 million to manufacture, Elon Musk, SpaceX CEO, says that an efficient refurbishment and launch operation could bring Falcon 9's per-launch price down to about $1 million. To get the launch price to $1M, the amortized manufacturing cost would need to equal refueling costs, or about $200,000. That goal implies reusability for 175 times - within a short enough time frame that the cost of capital doesn't increase the amortized manufacturing cost. That usage rate far exceeds current or projected launch demand. But if the market demand were there, the price would then be about $50/lb to LEO or about $100/lb to GSO! And that is with near term technology. This theme repeats through other costs. We need a STRONG financial entity to shoulder these linked financial and technical challenges. This why the Space Solar Power Workshop recommends that Congress charter a Sunsat Corp to build a power satellite industry, just as they chartered Comsat Corp, which built our very successful communications satellite industry. Japan’s USEF consortium has budgeted $2 Trillion yen (~US $25 Billion) to kick-start SSP by 2025. They expect to be able to provide SSP electricity to customers at eight yen (nine cents) per kilowatt-hour, six times cheaper than its current cost in Japan. A sample projected budget for a Sunsat Corp is available at the Space Solar Power Institute website. 2. Would the cost be more or less than that of other sources of energy being used currently? 3. Why is SSP being considered to replace other sources of energy? Answer 3. Here is a short list of what makes SSP so attractive compared to existing competing energy alternatives. I. SSP could provide virtually unlimited quantities of clean, baseload energy, without many of the negative aspects of the fossil fuels, (coal, oil and natural gas) currently in use. The rising price of oil is tightly linked to the rising price of food and other commodities that are processed, packaged and transported as global demand is increasing for oil, coal, gas and biofuels. Weather, or climate change, is also an inextricable part of this equation. This shift pushes land use from agricultural or wilderness into producing biofuels such as corn to ethanol or fuel oils, such as palm oil. Our “footprint” on our global environment must be lighter and gentler. A major way to do this is to shift raw energy production off the Earth into space. Imagine the plug on the wall in your house bringing energy directly from the sun. Large nuclear or coal power plants today are about 1 Gigawatt, which is enough energy for a million US homes during the day. SSP could provide many hundreds of Terawatts (1 Terawatt is 1000 Gigawatts). No other energy source can compare, without severe environmental damage to planet Earth. Compared to a typical thermal power plant of the same rating, SSP would contribute only about 21% as much waste heat. II. SSP would be baseload dispatchable. That is, it would be available 98-99% of the time except for 72 minutes at midnight during the spring and fall equinoxes. Experience with these brief outages is well known from existing satellites at GSO. A major challenge facing serious energy planners is how to incorporate intermittent power sources into the grid, such as wind or rooftop solar, which threaten to either decrease grid stability or increase customer costs. Legislative initiatives, such as Renewable Portfolio Standards (RPS), often require utilities to address climate change, in spite of a poor choice of alternative energy “tools”. Converting intermittent power sources to stable, dispatchable power sources is often listed among the “Smart Grid’s” basket of challenges. West Texas wind power is anti-correlated with Texas power demand, (ERCOT - Electric Reliability Council of Texas). That means the wind is most available when it is least needed. So store it, right? Well, we don’t really know how to store MASSIVE quantities of energy cheaply – that means we can’t afford to run a big city on batteries! Most energy storage now in use, such as the Compressed Air Energy Storage (CAES) Plant McIntosh, are really used for "peak shaving", or voltage or frequency modulation, not bulk energy storage. III. 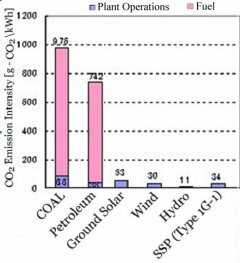 SSP emits very little CO2. (Fig. 2 below) It is an antenna (rectenna, or rectifying antenna, is the correct term). A U.S. Senate climate bill from 2010 assumed a price of $15 a ton of carbon dioxide equivalent. Utilities with large CO2-emitting generation fleets would be vulnerable to large costs associated with purchasing emission allowances, according to a study by Point Carbon. SSP could be a vital tool in conjoining common political desires to address global climate change without economically-punitive energy legislation. IV. SSP effectively uses no land (Fig. 3), they could have green farms underneath. That is because an SSP rectenna would have 95% light penetration, like chicken wire. V. Coal, gas, oil or nuclear plants use huge quantities of water in their steam cycle. Uses no water in operation, so does not compete for increasingly scarce fresh water. A typical thermal coal plant withdraws 25,000 gallons of river water to provide per average household. (How much water does your house use a month?) Output water temperatures into rivers are a related environmental concern that can and have adversely impact summer power plant operations in drought or heat waves. Many other commodities, besides water would benefit, since SSP would use, for example only 1/100 as much photovoltaic (PV) material as traditional ground PV, since SSP would use thin-film PV, and ground solar is usually crystalline silicon PV. 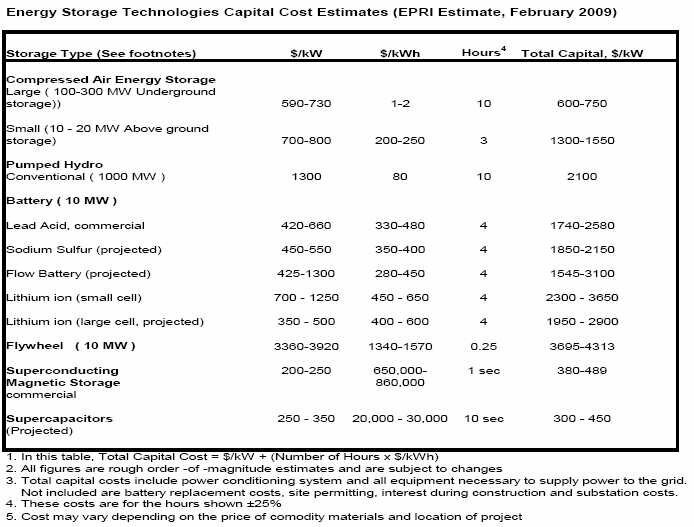 SSP would have a much higher EROEI (Energy Return On Energy Invested) than any other energy source – eventually 100 to 1. VI. Use no fuel, and operational personnel would be on Earth, not space, so marginal operating costs are expected to be very low. Financially they are similar to construction of big hydroelectric plants, like Hoover dam; high up front costs, very low operating costs. VII. A PV panel at GSO will collect about 9.6 times as much power per square meter per year as an average location in the continental US and require less maintenance. If you consider that ground PV would have to be stored using CAES, for example, with concomitant loss of efficiency to convert it to baseload, grid type power, SSP power provides about 142 times more useable energy per square meter per year. IX. In the conversion we face to move our transportation systems to over electric power or alternate liquid fuels, it should be pointed that liquid fuels can be made from SSP power, such as anhydrous ammonia, which can be moved through the same pipelines as gasoline. It is 111 octane. We have been making liquid ammonia for 50 years for farming. Ammonia is the only fuel other than hydrogen that produces no greenhouse gases (GHG) on combustion. Ammonia can be manufactured from water, air and energy. It also fueled the X-15 rocket plane! X. Unlike bio-ethanol, bio-diesel, or bio-butanol, SSP does not compete for increasingly valuable natural-gas-derived fertilizer, crops or agricultural land. Corn, for example, can continue to be a major export instead of a fuel to burn. Corn is a major constituent of milk, eggs, cheese, meat, and even Jack Daniels. XI. Unlike nuclear power plants, SSP will not produce hazardous waste, reducing nuclear proliferate. The SSP segment at GSO would be relatively easy to defend, while the earth segment would be hard to damage, making harder targets for terrorists. SSP would provide energy independence for those that develop it, reducing hostile competition for limited Earth-based energy resources and dependence on unstable foreign oil providers. As the oil and gas industry struggles to maintain production levels to keep the economy from crashing into recession or depression, the environmental impact is escalating. A controversial technique called fracking, short for "hydraulic fracturing" involves drilling into "tight gas or oil" formations of rock, such as shale, and pumping secret and toxic mixtures of fluid and sand under extremely high pressure. This shatters the rock and allows the gas or oil to flow more freely. Reports in the New York Times, an Oscar nominated film “Gaslands”, and numerous press reports have brought new pressure on Washington and affected state governments to protect our water supply, as energy needs increasingly compete for scarce fresh water. The Environmental Protection Agency (EPA) has initiated an investigation into the effects of fracking. The NYT reports that internal EPA documents show the danger to drinking water from fracking is even greater than previously understood - high levels of radioactivity and waste water treatment plants unequipped to handle fracking's new pollutants.The paper also alleges industry and political pressure on the EPA to limit the scope of its safety inquiry. Another critical issue with fracked fields is that they appear to have an accelerated depletion rate – their production rate declines faster than conventionally drilled gas and oil fields. This can give the impression that a fracked field will yield much more gas than it actually will because the driller is comparing it to a conventionally drilled gas field. Politics plays a big role, so it is extremely important to be careful in studying and documenting the issue. Don't expect the EPA's report on fracking to be released until after people have voted next year, ~ November, 2012. Politicians only want to lead when their constituents directly benefit. SSP would be a massive and exciting new opportunity, with millions of new jobs when the industry is built. While some folks have a gloomy perspective of the decades, ahead as global competition for dwindling resources increases, SSP offers a far brighter perspective, if we can swiftly start building clean baseload SSP. We could move the environmentally problematic primary energy production off the planet while providing much larger quantities of clean baseload energy to people with far less damage to our environment. Eventually SSP parts may be cost-effectively manufacturing off the Earth, but Sunsat Corp should not directly fund any of that work - such as lunar development. 4. How much more energy would SBSP give rather than the solar panels on Earth now? Answer 4. A PV panel at GSO will collect about 9.6 times as much power per square meter per year as an average location in the continental US and require less maintenance. If you consider that ground PV power would have to be stored to provide grid available power. Using CAES, for example, with concomitant loss of efficiency to convert it to baseload, grid type power, SSP power provides about 43 times more energy per square meter per year. 5. Once the solar panels were in space, how would the energy be transferred back to Earth? Answer 5. Wireless Power Transfer (WPT) for long range today comes in two competing technologies. Microwave Power Transfer (MPT) is the WPT technology currently nearest term available, but Laser WPT could also become competitive IF laser efficiency can be much improved. It is not currently an available WPT technology, the best available is around the 1 micron range, which is fully absorbed by the atmosphere, so it wouldn’t reach the ground. Today LPT suffers from low efficiency, and therefore too much “waste heat”. We will therefore assume MPT unless otherwise noted. Answer 6. See answer 5. 7. How much energy would be lost in the transfer from space back to Earth? Answer 5. Overall, MPT efficiency from PV output at GSO to grid input on Earth is estimated today to be 42% (Fig.5) for 5.8 Ghz. We believe that can be improved closer to 50% as the DC-to-RF process matures. To achieve the high beam efficiency desired the equations governing microwave WPT mandate very large aperture, or diameter, transmitters and rectennas. The greater those apertures, the higher the resulting efficiency. To reach the high efficiency necessary for economic operation these must be kilometers in size. 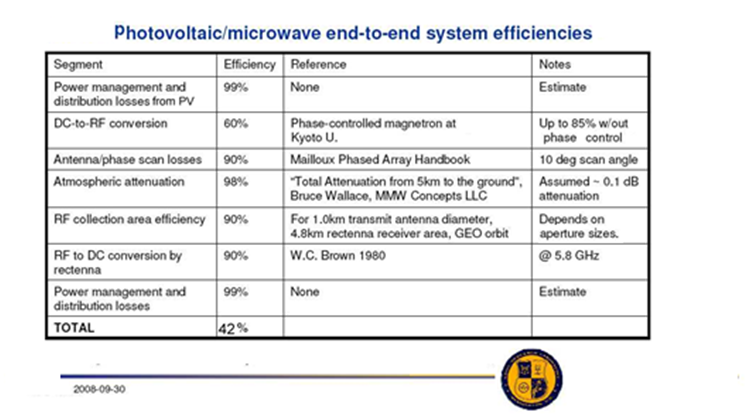 These dictate that SSP using microwave WPT is large – utility-scale. The original reference study suggested a 5 Gigawatt downlink rectenna broken up into one Gigawatt “chunks” by the utility contracting to distribute it. Much work remains to design and test arrays as large as these microwave power beaming designs mandate: ~ 1 km in space, ~ 5-10 km on the ground, depending on frequency choice. 8. How much energy is lost in the solar panels currently used on Earth? Answer 8. Solar panels on Earth range in efficiency from about 8% up to about 40% efficient, so their losses range from 92% to 60%. Note that photosynthesis is about 1% efficient in storing chemical energy. 9. Once the energy was back on Earth, how would they convert it into usable electricity? Answer 9. The MPT receiving antenna is known as a “rectenna”, or rectifying antenna, which outputs DC power. This energy would then be inverted to be fed into the power grid, which is AC power. 10. How many watts would it take to power a city? Country? The entire Earth? 11. How much energy would be received in SSP? Answer 11. The GSO orbit is so huge (164,620 miles) that we could eventually gather many hundreds of Terawatts there – hundreds of times what we use today. The physics of MPT (see Answer 7) makes SSP cost effective only if large quantities of power are transmitted. 5 Gigawatts per link was what the first major Reference study (1980) recommended. The physics has not changed, so MPT construction links will likely be handled only by large, utility scale companies. Utilities themselves are forbidden from building power systems that are not “off-the-shelf”, as PG&E made clear that they had accepted zero risk in signing their SSP contract with Solaren. 12. What effect would SSP have on the environment? Answer 12. The environmental impact of a MPT “rectenna”, has been exhaustively studied and found to be generally safe. Microwaves are not a new environmental issue; from your cell phone to TV and satellite communications. Power levels are the real issue, since microwaves are not mutagenic – they don’t break DNA, as ultraviolet and X-ray radiation does. The radio frequency radiation in the beam has less effect than an ordinary cell phone. The power beam would only be directed at the receiving stations. People would not be exposed to the path of the beam, as it would be almost entirely collected by the receiving station antenna, which would be elevated about 25 feet above the ground. Birds, bees and airplanes are able to safely cross the path of the beam without any problem because the beam bounces off of the aluminum of the plane and birds are only briefly warmed while they might be flying across the beam. Today, thousands of communication satellites, GPS and DirectTV transmit energy from space. Sunsats would utilize similiar technology. Since it is important to keep the downlink beam locked on to the rectenna to prevent violation of power density regulations (and keep power delivery flowing!) there will be an encoded phase-locked loop to continuously guide and guarantee that only when the beam is tightly centered on the rectenna will power flow – otherwise the beam would be turned off automatically. SSP will obey all existing local, national and international laws and regulations regarding the safe propagation of microwaves. If Laser WPT becomes a viable downlink alternative, other questions arise because the power density of laser would be much higher than Microwave. Since 1 micron laser is the expected wavelength to be used, it would be fully absorbed by the atmosphere. Therefore, it has been suggested that such Laser WPT be delivered to a tethered stratolite, or blimp, stationed at about 70,000 feet, well above virtually all the atmosphere, including birds. 13. What are the benefits of SSP? Answer 13. See the answer to question 3. 14. What are the disadvantages of SSP? I. SSP via MPT is constrained to very large power links, ~5 Gigawatts, which makes the cost of the first one very high and rather risky to correctly engineer all the numerous design, construction and operational details. Lower power levels are not cost effective because the system efficiency equations dictate that the antenna and rectenna apertures, or diameters, determine the efficiency. They must be very large, about 5 or 6 km across for the rectenna and 1 km across for the transmitting antenna in space. Laser WPT could efficiently deliver lower power levels, although it is not clear if the cost would be competitive at those low power levels or even why you would want to bother going to GSO to deliver small amounts of power. II. WPT technology still needs significant engineering work to be ready to design and build such huge phased arrays in space. We have never built such a large structure in space before, ten times as large as the International Space Station. This will not be done quickly so it is imperative that we begin soon if we wish to benefit. Like building a transcontinental railroad or a major new dam – plan ahead, SSP won’t happen quickly. III. Achieving and keeping correct phasing of the millions of microwave transmitters is one problem. Another issue is that designers working on solid state MPT - an alternative to magnetrons - cannot overcome the cooling problems resulting from low efficiency/waste heat buildup. IV. Defending the SSP satellite system from incoming meteors, solar flares, and even terrorist attack will require a new level of operational understanding of the space environment, although we have considerable experience based on the thousands of satellites which have orbited in space during recent decades. V. The geometry of MPT to Earth would tend to favor downlink sites nearer the equator, since the Earth is round and GSO is over the equator. Downlink sites at higher latitudes would have to have an elliptical rectenna to collect as much as a circular link at the equator. VI. SSP would continue degrading the astronomer’s problem with night sky “light pollution”. It would also better enable the construction of large observing telescopes in space and even on the back side of the Moon – which is the most radio-quiet observing environment in the solar system – a very desirable location. VII. The extremely profitable fossil fuel industries which dominate our planet’s energy supply often make it difficult for SSP to receive a fair hearing and proper funding for the massive engineering task of building it. They naturally prefer non-threatening energy alternatives, such as oilman T. Boone Pickens' $80 million lobbying support for windmills. 15. How is SSP more efficient than other sources of energy? Answer 15. First, what is the best way for you, as an energy consumer to measure efficiency? Ideally, energy should be available anytime and anywhere you want it without harming the environment we live in, or our grandchildren will live in. For a moving vehicle, liquid fuels have been the choice. In your home or another building, electricity has been the choice. What will be the most efficient way to provide this power ten years from now, when fossil fuels become dirtier to obtain and more expensive? As Appendix A explains, SSP will be more efficient in providing that “anytime and anywhere” (baseload) energy, since we don’t know how to store MASSIVE quantities of power from irregular and intermittent sources. 16. What action is being taken to start using SSP? Answer 16. The world leader in SSP design and construction is Japan’s well funded USEF consortium. Very little funding has been available in the US on the scale required. The Space Solar Power Institute, a 501(c)3 corporation, and its Ga Tech Workshop (http://sspi.gatech.edu), have studied this issue since 1994 and determined that the best and fastest way to get SSP built is for Congress to charter a Sunsat Corporation. Congress chartered Comsat Corp in 1962 (and also Intelsat) and thereby created today’s robust commercial communications satellite industry. The key legislation to do this for SSP is entitled the Sunsat Act. The Sunsat Act would create a commercial power satellite industry. Just as cell telephone companies are not power companies, they have very different goals. Communication satellites (comsats) now in use and the power satellites (sunsats) we need, differ in that sunsats would optimize for efficient power transfer, while comsats have optimized their signal to noise ratio. The Space Solar Power Institute has written draft Sunsat legislation and actively encourages Congress to charter a Sunsat Corporation, within the limits of the educational activities 501(c)3 organizations can fund. There are several poorly funded small US companies, notably Solaren, that claim to be building SSP. Major US aerospace companies, e.g. Lockheed-Martin, Boeing, Raytheon, and Northrop Grumman have been exploring the SSP opportunity, as well as various university and government labs partnering with them. This is an unfocussed effort. Astrium, Europe’s largest aerospace company has been looking for support to work with their partner, the University of Surrey, on laser power beaming for SSP. Space Energy is a trans-Atlantic company with SSP plans. China, India, and other nations have been studying how they could build Sunsats. Japan’s 18 company USEF consortium is the clear SSP leader today. While there are a dozen SSP efforts now in existence, led by the Japanese consortium, they need approximately $30 Billion dollars and ten to twenty years to transition to an SSP company with positive cash flow. No electric utility, aerospace company or other group we can identify in the US or Europe is chartered to meet the financial and technical challenge that building SSP poses. 17. What countries or companies are considering SSP? Answer 17. See answer to 16. 18. How would the solar panels be built? Answer 18. Solar panels for space are a well understood technology. Several methiods for deploying them have been considered from huge linked inflatables to unrolling large rolls of PV material like carpet. Keeping it in place and thriving in the vacuum of space through solar flares and micrometeorites are key design considerations, although these are well understood for the many smaller satellites that “live” there now. Space for Sunsats along the 164,620 mile arc of the GeoSynchronous Orbit would have to be negotiated when contracts to build are written with receiving utilities on Earth. 19. How would they be put into space? Answer 19. Since GSO is a high radiation environment and very hazardous for long term workers, virtually all SSP construction would be done remotely by robots operated from Earth (telerobots). There is some discussion about whether it is preferable to construct Sunsats in LEO or GSO, but if constructed in LEO they would have to slowly moved to GSO, where they would operate. 20. In your opinion, is SSP worth it? Answer 20. Unquestionably. It is the best economic, environmental, energy and long term investment in our future available today. It is not cheap, but it is surely worth the trouble and expense to provide clean, unlimited, baseload energy for the foreseeable future. An SSP industry would also provide a market in space for products that might be mined and manufactured from resources “up there” – on the Moon or from passing “Near Earth Objects”, thereby productively expanding our civilization into space. Sunsat Corporations should not be directly financially involved in any business except providing clean power to Earth. They would not for example, build rockets. Appendix A. How much more efficient is SSP compared to ground PV? PV panels can be used in space or on the ground. SSP would likely use thin-film PV, since it is much lighter and therefore less costly to send to orbit. It is uses 1/100th as much material as traditional ground PV. Ground PV is usually crystalline silicon, since the environment on Earth is far harsher – blowing sand, hail, bird droppings and high winds. We need to answer this question, “What is the efficiency of ground PV or wind power if converted into baseload (dispatchable) grid power?” We need to know this in order to collect energy from intermittent wind or ground PV sources and using storage convert it to continuous, or dispatchable, power to the local electric grid. ERCOT (they operate the Texas electric grid) quotes wind at 7.85% capacity factor because that's how likely wind is to be blowing when ERCOT needs the extra power. There are two operating CAES plants in the world. The more efficient of the two storage plants, Macintosh in Alabama, is effectively a 27% efficient natural gas turbine. It takes advantage of the unique salt dome geology along the Gulf coast to store pressurized air which later will turn the gas turbine-generator. A typical natural gas plant is 34% efficient, but because of the economics of being able to save cheap power from Saturday and using it on a peak day such as a hot Alabama Tuesday, you can provide expensive peak power at low cost. Some proposals envision using other geologic structures, such as old natural gas fields. This has not been done yet but theoretically could work, at an undetermined cost. Wind could provide that initial CAES charging, as the Iowa Stored Energy Project(ISEP), is now planning to do. So, to store the sun or wind with CAES, when it is blowing, how long do we need to charge and store it? Depends on the weather - season and location have a lot to do with that, and even Arizona has a monsoon season. In many places, weeks of negligible sun or wind are possible. To provide power for just one full day, however, suppose we have a 1 MW sun or wind power unit that over some length of time (far more than 24 hours) stores 24 MWH into our CAES. We can get about 6.48 MWH generated by our CAES whenever we want it. Suppose it takes 4 days of sun to fully charge the CAES to 24 MWH. That means we need 14.8 of these average sunny days to store our 24 MWh to cover one sunless 24 hour day for dispatch on the grid. Considering that we get 9.6 times as much sun per day in space from SSP, it is easy to see that we get about 142 times (= 14.8 x 9.6) as much dispatchable energy from space, compared to terrestrial wind power or terrestrial sun when we make them "CAES dispatchable". The real world is much tougher than our simple example shows however. We have looked at providing for just one sunless or windless day, but we do not really know how much such storage we will need next month or next year, which means our customers are likely to be inconvenienced when we don’t have enough stored. And they will not want to pay for infinite storage. No one will agree to build the massive CAES needed for such storage - not cost effective. This logic model should make clear that being able to get our power on demand is the most satisfactory way utilities can keep their customers happy and the ice cream cold. N. Johnson and P. Jaffe. (2008, Oct. 2-3). “Summary of NRL SSP Internal Assessment,” presented at the State of Space Solar Power Technology AFRL conference. unpublished.